And even though winning is not a measurement of a successful season, or good youth coaching for that matter, we did win lots of games and tournaments without taking any shortcuts and by doing things “the right way”! I thought I’d share what we did this year. Maybe it will help you and your team. Before getting started, read this post if you’re interested to see what we did with this exact same team last year as 3rd graders. We ran a 5 out motion offense giving players lots of freedom. I’m very happy with this offense because it’s a very simple and versatile offense that allows us to develop skills and teach fundamentals effectively. This year we primarily focused on spacing, giving players freedom to be creative, dribble drive, cutting fundamentals, rebounding, reading the defense when one-pass away, and a little bit of screening. Next year we’ll incorporate more away screens, maybe some ball screens, and maybe some post play. It will all depend on how quickly the players learn. The good news is there is no limit to the offense and we can continue building it in layers. And it’s all based on “fundamentals” versus memorizing plays, reads, or continuities. I also like that the positions are interchangeable so all the players learn all positions. The last thing I want to do is pigeonhole players into post, forward, or point guard positions. Here are the rules for our motion offense. As mentioned above, we do not incorporate or emphasize all the options yet. That will take several years. But from a big picture standpoint, these are the rules. Maintain good spacing (12-15ft) by filling 5 perimeter spots. Always fill the spot closest to the ball. After you pass the ball you can basket cut, screen away, or go to the ball (ball screen). On pass to the post, always cut and fill opposite. Keep good spacing (ex: if player in low post, cut to elbow and then fill opposite corner). If you are overplayed when one pass away, back door cut. If you are underplayed (sagging defense) when pass away, pop out. After you basket cut you can either clear to an open corner spot, post up (seal and pin), or back screen. Look to reversal the ball when you catch at top. If the ball is dribbled at you, back cut. On dribble penetration, players off the ball need to move, maintain spacing, open passing windows, and then fill the open “5 out spots”. Fill rebounding spots on every shot. Priority is weakside block, then front of rim, and then strong side block. 2 other players are back near “guard spots”. Here are some adjustments to make to the 5 out offense when facing zone defense. We did not incorporate any of these adjustments this year (we just “let them play” the few times we saw zone). But in years to come these are the adjustments we will make. Move corner spots in to the short corner. After you cut, hook back and look for the ball in a gap (for a 2 count). 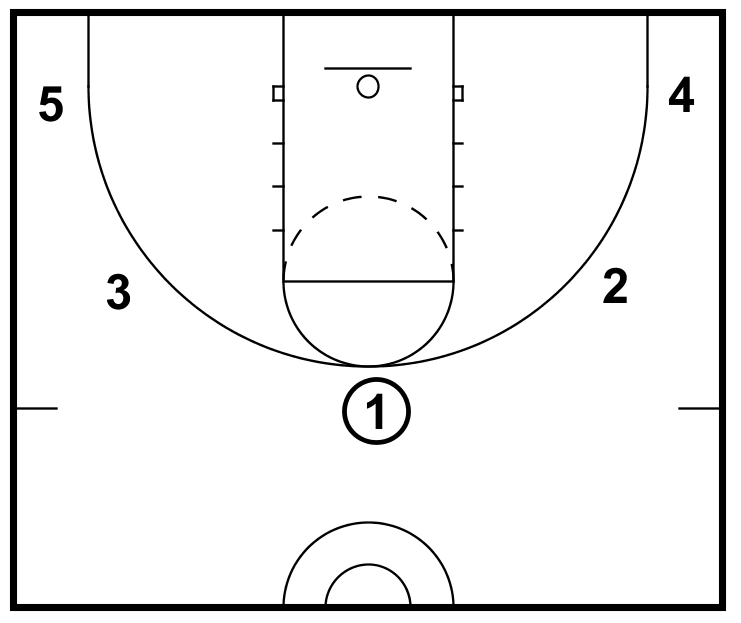 Short corner players can play behind the zone and flash cut to gaps (2 seconds). We ran one inbounds play called “box”. We never practiced the play. I just told players to get in a box and then get open. Sometimes I hollered at them to “set good screens” while they set up the play during games. They had to figure out the rest on their own. By the end of the season, most of them would set “up screens”. However some of the players would just cut and others would set cross screens. They rarely had trouble getting the ball inbounds. I can only remember one 5-second violation (although there were probably a couple others that I’m forgetting). We scored quite a few baskets off the play (although it was often due to poor defense). All in all I’m happy that we spent NO practice time on this play and it was very effective for us. We toyed with a couple quick-hitter entry plays to initiate our offense but never used them and settled on just ONE half-court play called low. It’s incredibly simple and we ONLY use it when we really need a bucket or at the end of the half/game. Low worked great because we have a bunch of players on the team that can beat their defenders in 1on1 situations. For the entire season, we spent a grand total of about 15 minutes in practice learning this play. It only takes a couple reps to learn and is incredibly easy. It’s for special situations only. But I really like this play because I think it’s a waste of time to teach youth players to run set plays and spend hours of practice time getting them to memorize the movements. We ran all man to man (player to player) defense. We applied a few basic guidelines to simplify the teaching process. That was the primary concept that we emphasized. Then other defensive concepts and lessons were taught with that in mind. Then they start figuring out how to solve problems on their own and figure out better positioning and tactics. Always pressure the ball. When on the ball, you should be close enough to easily touch the player. If you have a chance to steal the ball without letting them score, do it. Be aggressive. If the offense shows the ball, grab it with two hands. Get on the floor for loose balls. Always see the player you are guarding and the ball. Stay half way between the players you are guarding and the ball. The only exceptions are when you are guarding the ball or guarding someone in the post area. Hand in the passing lane when one-pass-away. 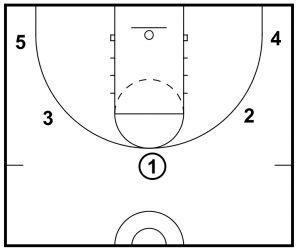 Deny all cuts to the ball and passes near the basket. Communicate every single time down the court. Call out the numbers and point to the player you are guarding. Call out “ball” every time you close-out so teammates know who you’re guarding. Lastly, we always double-teamed the ball when it went into the post and worked hard to dig the ball out. We have a very short team and we were at a disadvantage in every game we played. Our opponents towered over us and once the ball was inside they could shoot over us with ease. So we quickly double-teamed and dug it out every time. This was a critical adjustment that allowed us to compete. Our defense was a major strength and key to winning games. We have a very scrappy team. We spent about 15 minutes per practice on shell drill or various defensive drills. The rest of the teaching was on context of scrimmages, games, or offensive skill drills. – Do more than what is expected of you. Try harder. – Prepare (sharpen the saw) – enhance skills every day. – Be passionate – don’t be lukewarm, commit to excellence. – Never give up and don’t be afraid to make mistakes. – Never say the word can’t. No excuses. – Maintain a positive attitude at all times. – Make teammates better, lead by giving. – Be a great friend. – Be someone that can be trusted and relied upon. – Be responsible. Do all you have agreed to do. – Have an attitude of gratitude – say “Thank You”. – Be grateful and thankful for what you have. – Enjoy practices and the process. – Be caring and thoughtful in everything you do. – Treat others the same way you want them to treat you. Our core values are arguably the most important aspect of coaching. It’s a challenge to constantly keep them in mind and make them part of your team’s DNA. So I include our core values on every practice plan. We also try to incorporate our core values both on and off the court. As an example, to “help others” off the court, our team volunteered to ring the bells to raise money for Salvation Army. We organized groups and went to the local grocery store to ring the bell during our shift. It was a good experience for everyone involved. I should also mention that we emphasize “listening” from day 1. Our rule was… “when a coach is talking, your eyes are on the coach and you listen carefully”. We were sticklers about this rule. We had tons of fun. But listening was a requirement and important skill we focused on constantly. I can’t imagine coaching youth players without this rule. The majority of our time is spent on player development and improving fundamental skills. Protecting the ball when in triple threat and defender is close. Use footwork and keep the ball out of the middle (rip low below the knees or high above the head). Control dribble and protecting the ball when dribbling. Maintaining good spacing as the ball and other players move (string spacing). Creating good passing angles (opening windows). Getting the ball to roll off fingers the same way every time and in a straight line. We did not spend much time on shooting… just basic form. Our players are not strong enough or ready for a lot of shooting practice or instruction yet. We spend a lot of time on all aspects of ballhandling. I think that is step one for young players. This includes dribbling concepts, passing, decision-making, and even footwork (for ball security). My goal is for all 10 players on the team to have very strong point guard skills. I want them all to be able to beat double teams, beat their defenders off the dribble, make good passes, and so on. As a result, ballhandling is a big strength for us. We practice twice a week. Each practice lasted 90 minutes. We started practicing around November 1st and had our last practice towards the end of February. We also offer some occasional skills camps and small group training in the summer/fall. However we take the spring completely off and encourage our kids to play in other sports through out the year. In fact every player on our team plays soccer. Soccer has helped our players tremendously with foot coordination, agility, spatial awareness, decision making on the court (passing, spacing, etc), and more. There is a ton of overlap and universal concepts that apply to soccer and basketball. I think kids should be playing several sports seasonally so they develop into well-rounded athletes, avoid burn out, and so on. That is something I highly recommend. Some great sports for developing athleticism and coordination include soccer, swimming, gymnastics, martial arts, and small sided flag football. 90% of our practice time consists of skill development. In most cases we use combo drills to improve efficiency. Don’t get me wrong. When needed, we’ll break down isolated skills. And sometimes we review certain fundamentals. But for the most part we use “game based learning” (see below) and combo drills to develop skills. To teach offense, we take a piece of the offense and turn it into a skill drill. We have drills where we practice face cuts, passing, and lay ups at the same time. So we spend very little time practicing our offense. The majority of practice time is spent on fundamental skills and combo drills that incorporate pieces of our offense. We use LOTS of small-sided games and use “game based learning” in practices. This is a fun and effective way to develop skills. I’d say at least 50% of our practices consist of game based learning. Games can include 1v1, 2v2, 3v3, 5v5, 1v2, 2v1,2v3,3v2, etc. Then we adjust rules, boundaries, and so on to emphasize certain skills. As an example, if I want to practice beating defenders 1on1 in the open court, we might use the High Five 1on1 Drill. If we want to work on passing and ball security, we might play a game like Volleyball Passing. This game is played inside the volleyball court lines. Split players up into two teams. Players must complete 20 passes without a fumble, travel or going out of bounds. If the ball gets knocked down, other team takes it and starts passing right away. Volleyball Passing improves passing skills, decision making, pivoting, ball security, spacing, and so on. It can also improve communication by adding the rule “you have to call out the number of passes out loud”. The person who catches the ball has to call out the number; otherwise it’s a turnover. Players need to use their leadership voice. This makes every person on the team talk… not just the loud person. For more drills and ideas on game based learning I highly recommend a book called The 1st Century Basketball Practice by Brian McCormick. We played in 8 tournaments and brought 7-9 players to each tournament. We didn’t bring all 10 players because it’s rare they were all available and I didn’t want 5 players sitting on the bench. Our players exceeded my expectations in regards to winning. 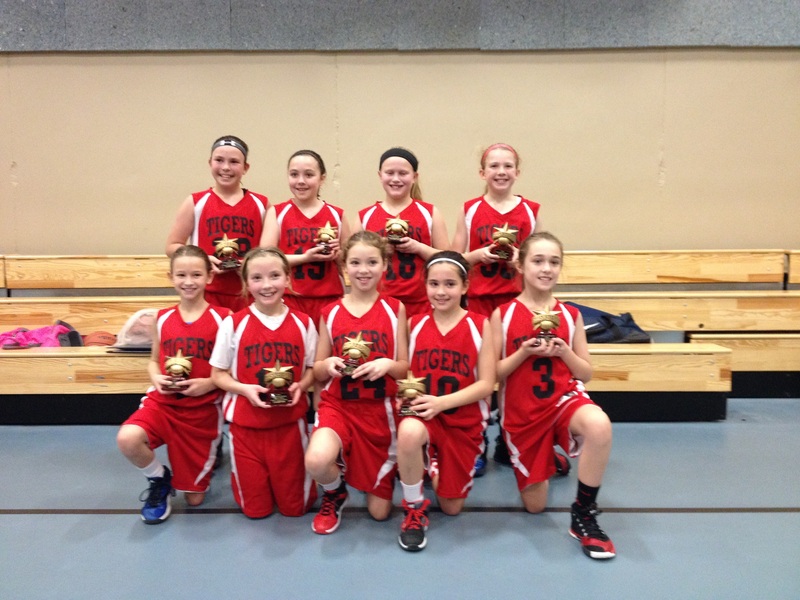 They did not place in their first two tournaments – but after that we only lost two games. They ended up with four 1st place finishes and two 2nd place finishes! Not bad for an undersized team that, to this point, has accepted all players that wanted to participate (no cutting). Nor did we cut corners or try to take short cuts in regards to coaching. We focused on basic fundamentals and doing things the right way. As a result. our players were more skilled and more aggressive than most opponents. 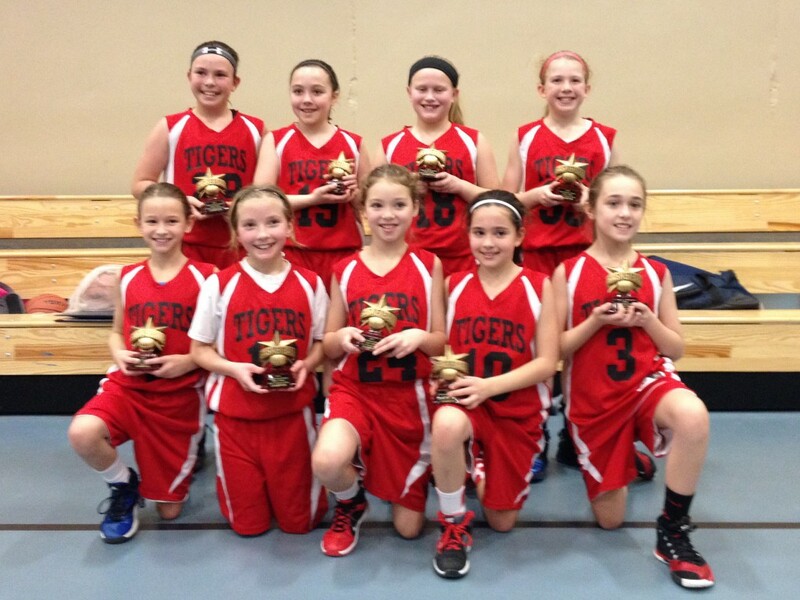 We were able to win because of their skills and their aggressiveness (effort). It’s always nice to win. But I would have been pleased with this group whether they won games or not. And I only point out our wins to show coaches that you don’t have to take short cuts. You don’t have to go to that 2-3 zone or full court press defense. You don’t have to spend time on plays to overcome deficiencies. Focus on fundamentals, teach life lessons, and be persistent. We are fortunate to have a few parents that keep track extensive stats. We focus on and report “hustle stats” back to our players. Those hustle stats include rebounding, force jump balls, steals, blocks, deflections, and force turnovers. We also show players their Value Point Score and utilize the rating to motivate them to play the right way and improve. The stats app we use calculates the rating for you automatically. I am a big fan of stats and track stats in every game we play. We use the Shot Spotz training markers for a number of skills drills and offensive spacing drills. Just like most coaches, we use cones frequently (in almost every practice). I use this clipboard because I can put tournament rosters and paper in it. This allows me to carry around just one thing at the tournaments. In tournaments, they require us to use full sized 28.5 women’s basketball. But in practices we use the lighter youth basketball so we avoid bad shooting habits.